The Natya Kalalayam Academy of Dance will celebrate its 40 years of existence with a duet performance of Kuchipudi Dance, Natya Dwayam, by two of India’s most sought-after Dance Duos "The Mosalikantis". For those looking at a unique understanding of the different forms of the Classical styles, or a dancer who is curious about this beautiful and challenging dance form, this programme is for you. Jaikishore Mosalikanti, a multi-talented artist has earned a reputation as a formidable Kuchipudi exponent in India, United States and Europe. He began his dance career at the age of seven under Padmabhushan Guru Dr Vempati Chinna Satyam of the Kuchipudi Art Academy, Chennai. Together with his wife Padmavani Mosalikanti they will be presenting Natya Dwayam - complimenting each other in the nuances of this beautiful classical dance style. 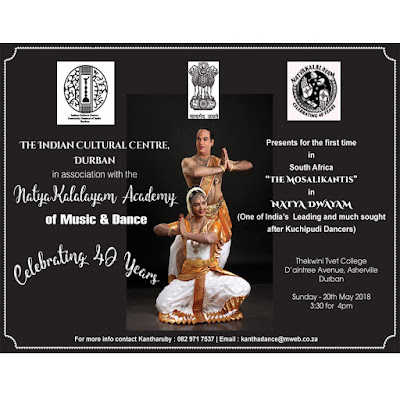 A first for South African audiences, this is a presentation in association with the Indian Cultural Centre, Durban.